National Jandal Day is an annual fundraising event held by Serf Life Saving New Zealand (SLSNZ), the national association that represents voluntary lifeguard clubs across the country. The event is typically launched on December 2. Surf livesaving is a movement that originated in Australia in the early 20th century and eventually expanded to other countries including New Zealand. Voluntary lifeguard services are one of its key aspects. SLSNZ represents more than 70 clubs and about 15,000 members. But why National Jandal Day? Jandals (short for Japanese sandals) are a type of open-toed sandals that are known as flip-flops in the United States. They are typically worn on the beach that is why SLSNZ chose them to symbolize its annual fundraiser. 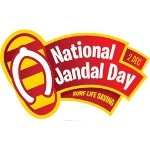 National Jandal Day focuses on raising money for the purchase of equipment and resources for local surf patrols that keep people on the beaches safe. It is an opportunity for everyone to lend the country's lifeguards a helping hand. National Jandal Day was launched in 2007. In recent years, it has been more often referred to as Surf Life Saving Summer Appeal (as New Zealand is located in the Southern Hemisphere, December is the first month of summer there).